Only 2 Lady owner plus RICHARD HARDIE PEUGEOT. 12 month RAC roadside assistance, 12 month MOT, 3 month RAC parts & labour warranty. Electric windows, Remote central locking, Radio / CD / Aux. Ideal 1st car Low insurance group, upto 70 MPG and only £20 to tax. New clutch recently fitted. Serviced at 9K 19K 45K 53K 68K & 73k . Air Con, Front Fog Lights, Radio/CD With Steering Wheel Mounted Controls, Electric Door Mirrors, Electric Windows, Air Bags Front And Side (Passenger Air Bag Can Be Turned Off), ABS, Isofix child seat anchor points, 3X3 Point Rear Seatbelts, ANY INSPECTION MORE THAN WELCOME, Full fresh 12 months MOT, 12 Months RAC Roadside recovery plus 3 months RAC parts and labour warranty (can be extended to 3 years). 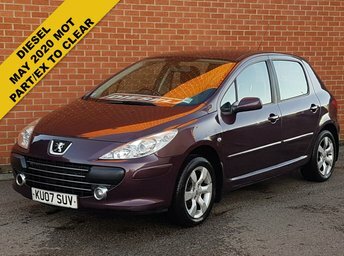 Looking to save money on a used Peugeot for sale in Gateshead? You can always be sure of finding a great deal when you come to North East Part Exchange Centre Ltd. We're proud to be one of the region's leading pre-owned vehicle specialists and with a huge range of quality vehicles to choose from, you're sure to find a second-hand Peugeot that fits your requirements. If you're looking to save on a used Peugeot 206, or want to enjoy the thrill of a used Peugeot RCZ, be sure to speak to a member of our team. Call, get in touch here on the website or pay a visit to the showroom in person.